Eliza Edens is a Berkshires-bred, Philadelphia-based singer-songwriter. Born to a gardener & a journalist who would blast The Beatles, Canned Heat, & Peter, Paul and Mary during car rides to-and-from their rural Massachusetts home, it’s fitting that Eliza is a musician who takes an observational approach to the natural world around her. Combining adventurous fingerpicking with a knack for heart-tugging melody, Eliza writes songs that swell into meditations on memory, nature, time, love, and loss—belonging somewhere between your tumbledown front porch stoop and a hazy bar in the big city. She is a grantee of Club Passim’s 2017 Iguana Music Fund and is currently crafting a debut record. in Austin, TX where he further honed his songwriting into what his fellow musicians came to call ‘Bummer Folk’. 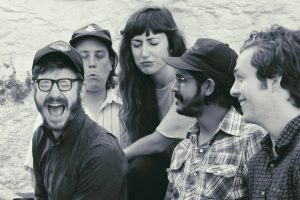 Drawing sonically from the Alt-Country genre, The Loblolly Boy is dynamic, going from a whisper of a verse to a raucous chorus in a matter of beats. Whether in a listening room, bar, venue, or living room, Kalloch feels right at home with his sad songs.